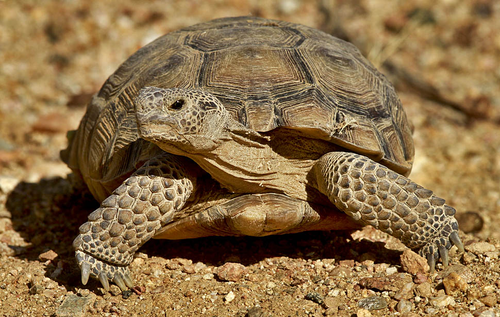 Help Save the Desert Tortoise! The Desert Tortoise Council is engaged in a fundraising campaign through Green Our Planet. The Desert Tortoise Council plans to use the money to reintroduce desert plants into a habitat to make it livable for the tortoises. Without the right plants to eat the tortoise cannot survive. Essentially, we will use the money to prepare the habitat so we can re-introduce the tortoise back to this area of land in North Las Vegas. Your donations to the Desert Tortoise Council support research and conservation of desert ecosystems. Donations to the Desert Tortoise Council are tax-deductible to the full extent of the law. you@domain.com - please type your email carefully. Please use an email address that is unique to you. Our database will NOT recognize shared email addresses. Please make my donation anonymous (do not acknowledge me by name in the DTC newsletter).